Nancy is a perfect mentor for churches wanting to start a needlepoint project. Whether it’s one or two pieces or completely adorning your sanctuary with kneelers, cushions, and hangings. 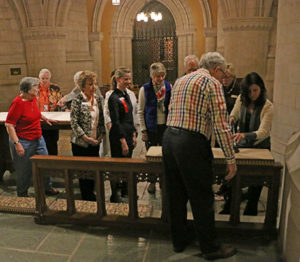 She has worked with faiths that include Episcopalian, Catholic, Methodist, Baptist, and Lutheran, along with chapels at boarding schools and colleges. She has also assisted with custom canvas painting & needlepoint finishing services since 1983. You may schedule a consult with Nancy to receive more information regarding this phase of a project. Designing, painting, choosing, and pulling wool is a fun part of these projects. Nancy will energize your group and provide you with all the necessary materials to create needlepoint art specifically for your church. Maybe someone from your church community has a knack for upholstering. We will schedule a hands-on workshop and share our proprietary knowledge so they can finish your needlepoint pieces with professional results. We supply materials unique to our company. We are available for guidance and consults throughout your project, you will not be left alone. Invite Nancy to visit your church and she will evaluate the condition of your needlepoint furnishings. You will receive a hands-on demonstration of onsite repair-work, cleaning and regular maintenance. A customized Conservation plan with written instructions, schedules, a list of materials and equipment necessary to execute the methods. Consultations can be in person in the DC-metro region or online via skype. An initial phone consultation is complementary. Onsite visits are charged a fee based on location and time spent. Travel fees may apply for in-person meetings. Wayne United Methodist Church, Villanova, Pa.